Hi, I'd like to show you this page I found on Belpre Furniture's website. 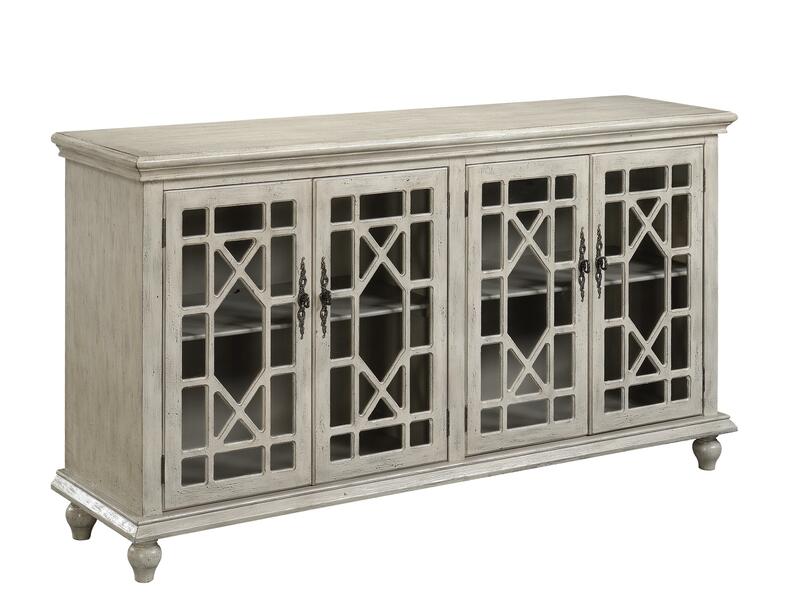 Make a statement with this eye-catching, textured media credenza. The beautiful geometric-shaped Chinese Chippendale fret work overlay allows a peek into the four doors. Simple moldings accentuate the horizontal shape and the ornate door pulls add even more detail to the doors. The Accents by Andy Stein Media Credenza by Coast to Coast Imports at Belpre Furniture in the Belpre and Parkersburg, Mid Ohio Valley area area. Product availability may vary. Contact us for the most current availability on this product. Add a gratifying touch to any room with these accent pieces from the Andy Stein collection. Bringing forward casual, contemporary, and classic styles, this collection is sure to have something to highlight any room. Smooth multicolor finishes, metal accents, glass inserts, and an spacious drawer and door storage options make this a collection of fine pieces for any home. Bring home Andy Stein accents and add individuality to your rooms. The Accents by Andy Stein collection is a great option if you are looking for Contemporary Traditional Casual Cottage Coastal furniture in the Belpre and Parkersburg, Mid Ohio Valley area area. Browse other items in the Accents by Andy Stein collection from Belpre Furniture in the Belpre and Parkersburg, Mid Ohio Valley area area. Belpre Furniture features a great selection of living room, bedroom, dining room, home office, entertainment, accent, furniture, and mattresses, and can help you with your home design and decorating. View recent additions to our online furniture gallery. Belpre Furniture offers great quality furniture, at a low price to the Washington, Athens and Meigs counties including Marietta, Little Hocking, Athens, Beverly, Vincent, Waterford, Pomeroy, Albany, Newport, New Matamoras, OH and Wood, Wirt, Pleasants, Ritchie, Calhoun and Jackson counties including Vienna, Williamstown, Elizabeth, Washington, Ravenswood, Ripley, Spencer, St. Mary's, and Harrisville, WV area.